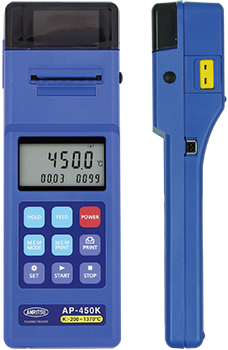 Mode AP-400 series thermometers have built-in printers for on-the-spot printing of measurement data. Manual print-out is available simply by pushing the PRINT key. Measured data with absolute time(Hours:Minutes:Seconds) can be printed. The numbering print provides the sequential numbering and measured data. * Switches automatically to 1°C resolution range when messured temperatures fall outside the 0.1°C resolution range. This product is available for repair. Please ask our dealer.